Little did i know that there was a country southeast of Sweden that produced Kendamas, and have been doing so for quite a while,since 2010 actually. Kromkendama were kind enough to supply Androidistica with two of their beauties of Kendamas for review purposes. Remember, these things are a lot of fun and need no software updates, google accounts or charging. Those three facts dont match too many common day activities anymore, which is why i feel they are presenting a welcome break to our binary existences. First one tested is the "Mimoe X Krom". Available in three different colours. A love child born out of the collaboration between Team Krom and Tokyo Based Freelance illustrator Mimoe Dono. 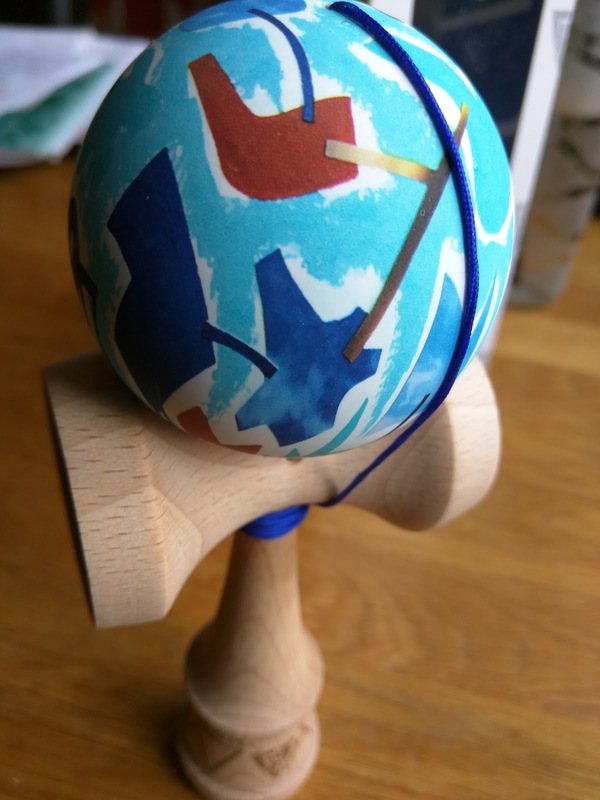 The review- Kendama is "Mimoe Geometrix Blue". A standard size Kendama , the "Ken" made out of Beech and the "Dama" with a slip-safe rubber top and a slightly larger hole for "endless spikes" as Team Krom describes it. 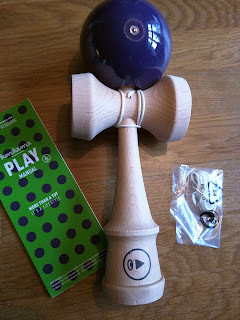 Neatly packaged, with an extra string and a rare "MimoeXKrom Sticker", this Kendama is a beauty to lay ones eyes on. Pretty as a picture one could say. The Ken itself, as with the cups are very well-crafted. This Kendama breaths quality at first glance. No rough edges, bumps or uneven surfaces anywhere on the actual Ken. Well-balanced , with a good quality string (blue) this feels as a long-runner in terms of durability. The non-slip surface on the Dama (the ball) seems durable as well,even after testing by me and our 5 year old no visible paint chipping or cuts are visible. 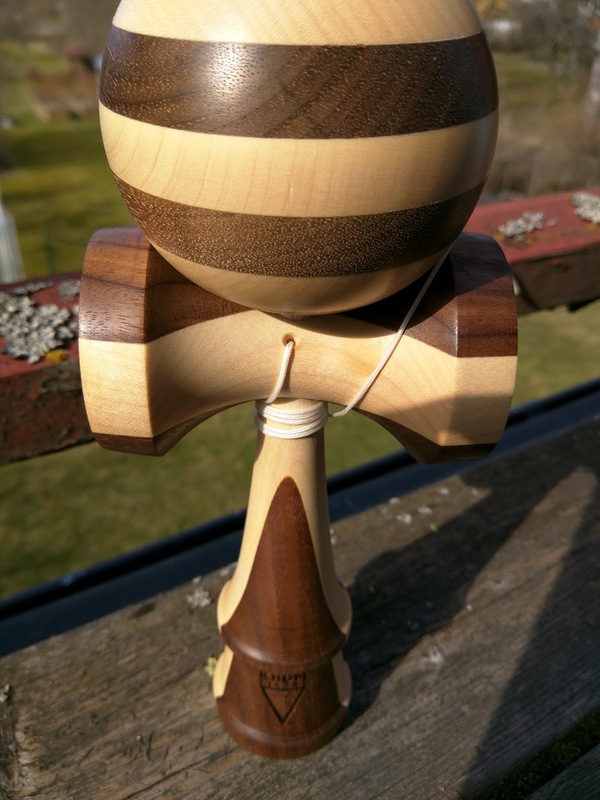 The MimieXKrom feels like a quality Kendama which should hold for a lot of jamming. Visually stunning and well-balanced . The second one is the "Krom Viking". Made out of hardwood, and slightly larger than your average Kendama the Viking really sticks out. Bear in mind, this is not an X-large Kendama, more a larger one that standard. There is a great video on Youtube describing the need for a larger sized Kendama, it all makes sense really and make sure you watch the clip. The Viking is really smooth all over, the hardwood Dama and Ken glows dignity and "Vikingness" all the way. The Viking is a lot of fun to play around with. Those harder tricks, "Around the world", "lighthouse" and just "spiking" gives a higher success ratio with the Viking for me as a novice in the Kendama-field. 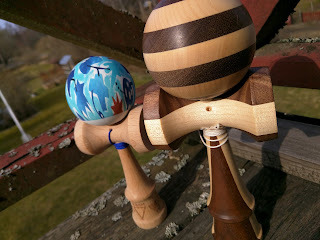 The overall feel of the Viking is geniune, heavier than the average Kendama but in that also bringing stability. I can imagine the Viking to "age with beauty", due to the hardwood material in the Kendama. Even a few marks on the "Tama", gives it just a little bit more patination. If you buy a Viking, and have kids who are into Kendama make sure to buy the kids ones as well because they will not let you have it by yourself! A whopping high-five to the Kromkendama for having Androidistica review their beauties, keep an eye out for an interview with the Krom-team !